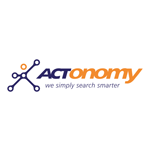 Developing semantic technology for HRM applications over the last 10 years, Actonomy now brings semantic search to a next level by learning what the user is looking for. Users often use search keywords that are not recognized by semantic systems leading to no results. By learning from the user search behavior, Actonomy now solves this problem : all new or unknown search terms are automatically added using machine learning. The result : a system that systematically adapts itself to the user context with goal to systematically provide better results not found by traditional semantic search systems. Adaptive semantic search & match is based on advanced combinations of machine learning, neural networks and AI. By setting up the adaptive semantic search as a cloud service, Actonomy clients to not only avoid investing in own platforms but have the benefit that the system learns quickly and adapt very fast to new trends, new search terms and new ways of looking for candidates and vacancies – used by all Actonomy clients and their users!